Esen Bozkurt is an artist with greek origins (her father from Crete and her mother from Thessaloniki) and she was born in Izmir in Turkey, where she currently lives and works. From the beginning of her education in Izmir at the Fatih Collegiate, she leans toward the use of watercolor and oil painting and makes her first portraits exhibition at the College. She then continues her apprenticeship with the painter Ugurtan Seba (1992-1998) and next with the famous watercolorist Ali Riza KÄ±rkan (1998-2008). Finally, since 2008, Esen Bozkurt founded her own studio where she works independently, sells, and makes her own exhibitions in public cultural centers as private places. For Esen Bozkurt : "art is a universal phenomenon. People of different languages, religions and culture, meet in the art. If you get lost in a painting, if you enter into an image, then you can creates a true artwork". 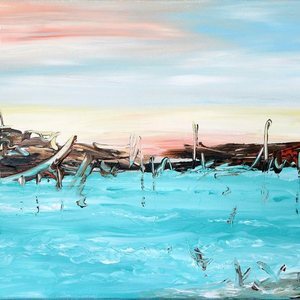 Producing magnificent Impressionist style artwork, Esen Bozkurt represents landscapes, portraits, still lifes, but also lyrical abstractions. Each art immerses the viewer's eye in a world other than the real, but still in surprisingly reminding the real life. The mixtures of colors, soft tonalities, fuzzy lines, the descripton of landscapes and scenes are filled with her own poetry, helping us to escape in instants of dreams : "I love to dance with colors... the enthusiasm and the calmness of the nature makes people feel peacefull and free ; I hope that those who look at my painting get lost in the interior of the picture and take themself away, in another place... " Esen Bozkurt makes all of her paintings with emotional and intuitive feelings with an internal perception of empathy. During the painting process, she lost herself in a time where exists only a peaceful environment.